Polansky and Canada’s hopes for a winner are gone. 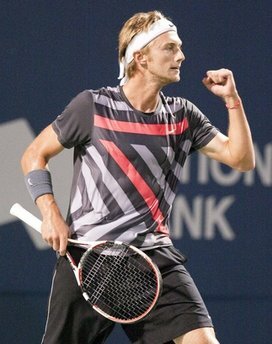 Peter Polansky was ousted from the tournament on Wednesday, falling 6-4, 7-6 to Romanian Victor Hanescu at Rexall Centre in Toronto. The 22-year-old from nearby Thornhill, Ont., was the last Canadian standing in the main draw of the $2.43 million (U.S.) event at York University. It has been more than 50 years since a Canadian won the title. Robert Bedard won the championship in 1958, which was his second straight win at the event. Polansky was one of four Canadian players granted a wildcard entry. He had opened with an upset win over Austrian Jurgen Melzer, becoming the first Canadian in seven years to beat a player ranked in the top 15 at his home tournament. 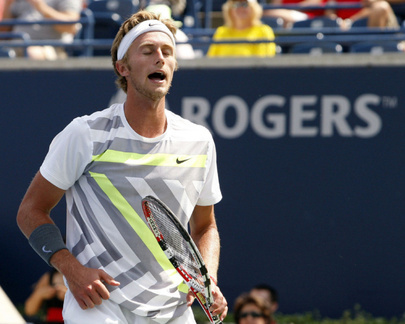 Polansky pulls off a stunning upset at Rogers Cup. In a stunning upset, Canada’s Peter Polansky ranked 207th in the world, played a brilliant match, placing shots perfectly around the court, to upend Austria’s Jurgen Melzer 7-6 (8-6), 6-4. A semifinalist at the French Open this year, Melzer is ranked 15th in the world. “I played unbelievable. I played my best tennis,” gushed Polansky afterwards. “I had some good practice against some top guys (including Roger Federer) and I was playing really well in practice so I came out here really believing that I could beat this guy. That’s what I did. I’m so happy with the way I played. Polansky showed tremendous grit and fortitude — he had seven set points before closing out the first set — and never wavered when Melzer showed signs of life. That’s no surprise considering what the 22-year-old Polansky went through to even get this far. Four years ago he lay in a Mexican hospital room as doctors pondered whether they should amputate his left leg. Polansky, 18 at the time, was in Mexico as an alternate on Canada’s Davis Cup team when, while sleepwalking, he believed he saw a knife wielding man hovering over him. He smashed through the window and it was likely the shrubs that saved his life. The glass ripped open his left calf and almost cut a major artery. It took five hours of surgery and 400 stitches to fix the damage but only after surgeons decided not to remove the leg. There were questions as to whether he’d walk again, let alone play tennis, but he began to rehab after two months in a wheelchair. It was just three months after the accident that he was back on the court hitting tennis balls. He’s never had a sleepwalking incident since but, as a precaution, he gets a low-level room when in a hotel on the road.